In the cooler months there is an undeniable allure to large-scale resorts with lots of indoor and outdoor activities, great public rooms, long sweeping hallways, varied dining and spa options, and at least a fireplace or two. 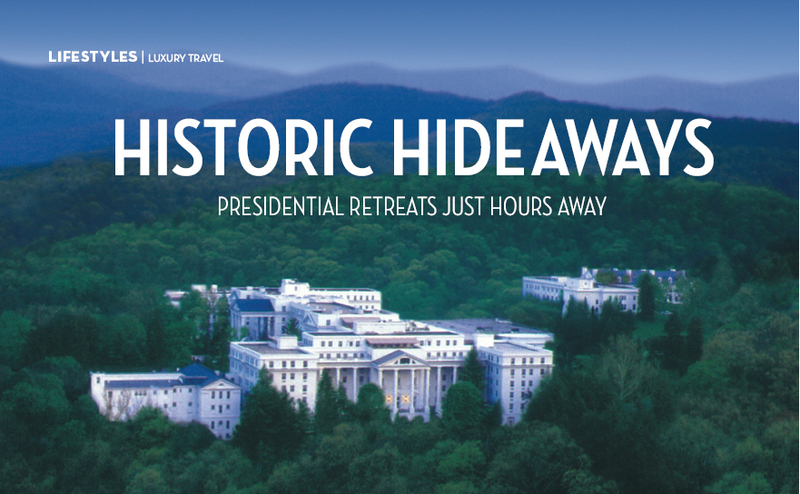 This won’t be new to many locals, because both The Homestead and The Greenbrier have been hosting Washingtonians for decades. Babies have grown into grandparents over the course of dozens of family visits to celebrate birthdays, weddings, holidays, and simple seasonal getaways. The driving distance to both resorts is just over four hours and almost entirely on highways that meander through handsome mountain terrain. Both resorts are suitable for extended visits, but ideal for a long-weekend, for couples, extended families, or solo travelers. Knowing both the Homestead and the Greenbrier well, but having not checked in for a few years, I revisited both in late autumn to find out what’s new - and old - because old isn’t a bad thing in a venerable resort. We tend to go to such places precisely because of their old-world charms, and while we want them to be up-to-date, we don’t expect or want them to be ahead of trends. Both resorts have rich histories, but The Homestead, opened in 1766, has more, including that most famous Virginian, Thomas Jefferson, who was a dinner guest in 1818. A handsome library outfitted with chess tables and chairs has framed photos of notable guests. The Greenbrier opened in 1778, but can match The Homestead in VIPs, not least because every president since Dwight Eisenhower has stayed in its Presidential Suite. While approximately the same in size and scope, the resorts are different in sensibility. It’s like comparing the Chevy Chase Club to Congressional. Southern hospitality is the gracious mandate at both hotels – and both do it well – but if they had to be specifically defined it would probably be that The Homestead is more genteel, while The Greenbrier is grander. The Homestead is made of colonial red brick with white trim, there are rocking chairs on verandas, and the great hall lobby is a scramble of happy toddlers. It’s nestled in a valley in the Allegheny mountains, and a cozy aura prevails. In white stucco, The Greenbrier looks like the White House on steroids, which is okay, because it means there is room for about 1,400, rather than just one family. Everything is big – the ten lobbies, dining rooms, guest rooms, lawns, pool, fitness center and spa – but it never feels daunting.